The Expendables explode back on to the screen once more with another selection of screen action legends joining the regular team. These include Wesley Snipes, Antonio Banderas and Harrison Ford. Their mission: to foil Expendables co-founder Conrad Stonebanks (Mel Gibson) who is out to destroy them. 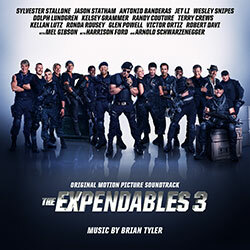 Composer Brian Tyler is one of the most prolific creators of action scores in the business and he also reunites with the regular team following the success of the first two soundtracks (also on Silva Screen). In the last decade he has created a wide selection of music for many films including The Fast And The Furious, Aliens Vs Predator – Requiem, Battle Los Angeles, Iron Man 3 and Thor: The Dark World. A previous release on Silva Screen, Rambo , has been a consistent seller and has been applauded as a fine successor to Jerry Goldsmith’s original music for the series. Fast becoming a go-to name on the Hollywood composing scene his next projects include Teenage Mutant Ninja Turtles and Avengers: Age Of Ultron.